Retail has rushed to embrace technology in recent years. Just as consumers have armed themselves with a dazzling array of devices (I sit now with a laptop perched on my knees, a smartphone in my pocket and a tablet in my bag), merchants have kitted out their stores and staff with tech. Done right, that's a good thing. Technology can augment and improve the shopping experience immeasurably. But we should never forget the power of human connection in retail, the strength of a story well told and the lasting impression of great visual merchandising brought to life in good old-fashioned three dimensions. All of that hit home to me when walking through New York one night earlier this week. What seemed most magnetic to the people in the streets and stores that I observed was not the touch-screen Amazon digital poster ("Tap Screen to Shop"), or the massive screens in H&M, but the physical magic of Rockefeller Center and the traditional imagery and retail techniques employed in the surrounding stores. Standing majestically at the heart of Rockefeller Center is the Christmas tree. This year, it is an 85-foot (25 meter), 90-year-old spruce, harvested from the front yard of a century-old farmhouse three hours west of New York City (Great story). Below the tree, skaters glide around the iconic ice rink; bit players in their own private New York movie scene. Across the street is Saks Fifth Avenue, with its elegant holiday windows and a storefront bedecked with 71,000 lights. Around the corner is lifestyle store Anthropologie, with some of the most beautiful, meticulously crafted displays you will see anywhere. This is retail art at its finest, with intricate scenes of birds perched on trees and New York buildings. It's not all technology-free. One of the highlights is Saks' all-singing, all-dancing 3-D video projection show. 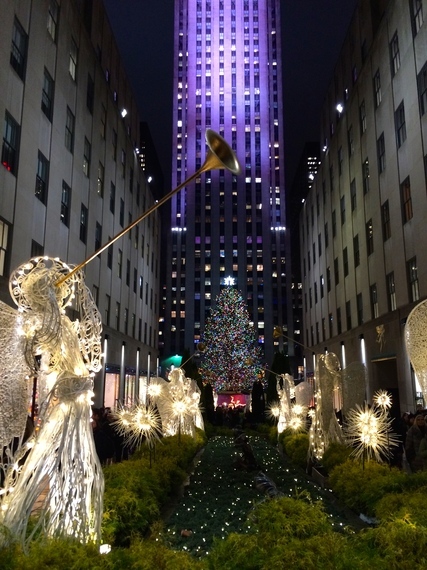 But for the most part, the experience in and around Rockefeller Center is traditional and physical, not digital. Perhaps this is the time of year when the classic captivates consumers, and we all buy into a vision of times past (Tiffany's Christmas campaign this year is very nostalgic). I do think though, it's also a reminder that the "thrill of the old" can match the pull of the new, and that a retail "experience" doesn't have to be technology-driven.